Lately the words intelligent web maps have been used widely, and during the Esri 2011 International User Conference opening plenary session intelligent web maps were highlighted by Jack Dangermond and demonstrated throughout the day. So what makes for an intelligent map? At the highest level the idea of intelligent maps is based on the fact that maps are fundamental to understanding our world, doing our work, and solving problems. They’ve evolved from simple paper maps to web maps that can be easily created, shared, and used in many different ways. And they’ve also grown in their ability to encapsulate and present geographic knowledge and capabilities, and deliver that to anyone, not just GIS experts. As GIS users we make maps to help solve problems and communicate with others, and maps capture our knowledge, tradecraft, and skills. We also use them to empower others with geographic information. We realize that geographic information increases in value with availability; information locked behind doors and inaccessible is of little value and often no better than no information at all. Intelligent maps help deliver geospatial knowledge to everyone in an easy to understand way. While a high-level understanding of intelligent maps is easy to gain, at the core development level of ArcGIS Online intelligent web maps aren’t just a notion, they’re a specification. As ArcGIS Online began evolving over a year ago, a decision was made to create a core substrate based on a specification called a webmap. The webmap would be a well-designed and architected foundation for other applications to leverage, and would encapsulate growing functionality into its core specification. As the webmap gained new capabilities and updates were made, the clients that consume them would be updated at the same time to support these new additions. For example, when map notes and pop-ups were added to the core webmap specification, all clients using the webmap (such as the ArcGIS.com map viewer, ArcGIS Explorer Online, and ArcGIS for iOS) were all updated to support the new aditions to the webmap spec. The webmap foundation at the heart of intelligent web maps ensures that the maps, and all they support, can be used anywhere, even in custom applications and embedded in websites and blogs, and on many different devices. This foundation also ensures that applications don’t grow functionally in isolation, but rather make for a cohesive and integrated ecosystem that provides a common foundation for all, and helps to deliver on the practical real benefits, not just the vision, of intelligent maps. 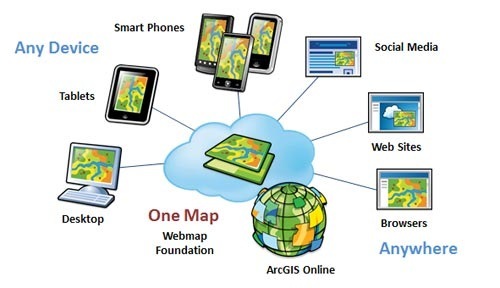 Visit ArcGIS.com, the Web gateway to ArcGIS Online, to begin discovering and using intelligent maps.